At MOTDRA, you'll find competition tempered with camaraderie. Veterans will help newbies along the trail. All breeds of horse and all ages of riders are welcome. We have something to offer everyone, from 15-mile, easy going competitive trail rides for beginners to hell-bent-for-leather endurance rides of 50 miles a day or more! Members earn points and miles along the way and are rewarded for their accomplishments. We keep in touch with a newsletter and an annual meeting where we share awards, food and fellowship. 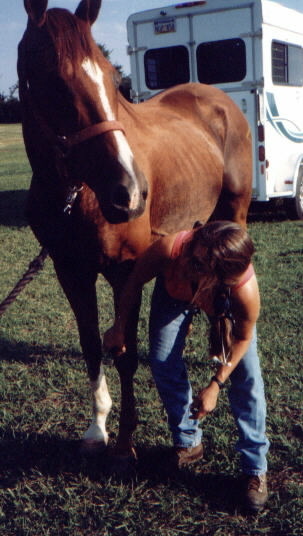 Dr. Jeanie Hauser examines a horse before competition. 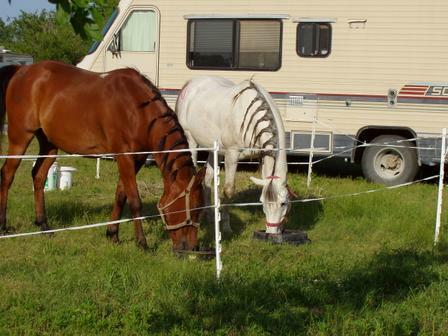 Competitive trail rides (CTRs) are judged by veterinarians.